Launched in 2006, Acuity Scheduling is an appointment scheduling software that lets your customers book appointments online and by themselves. You no longer have to go through email or phone tag with your clients to find a convenient time and you can focus on your work. This blog post in an Acuity Scheduling review introducing the features that made the success of the software (availability and calendars, appointment types, form questions, user management, integrations, sync with other calendars, payment settings, email settings). With Acuity Scheduling, you start by setting the times when you are available. You have two options : either set regular weekly hours or if your availability is not based on regular hours, opt for specific days setting. 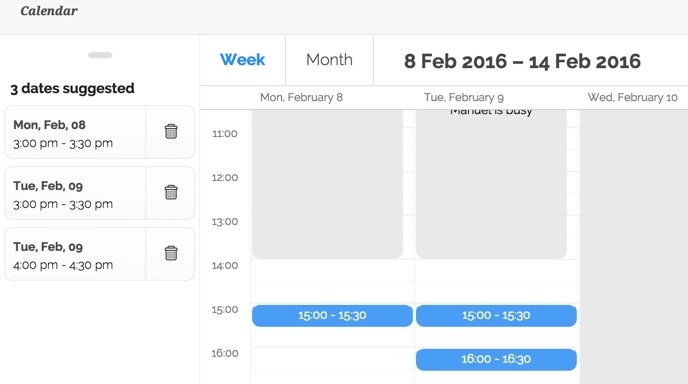 If needed, you can create many calendars if your availability is different for the types of appointments you accept. For each type of service or class, you have many settings. Then, you need to link these appointments types to the calendars you previously set. Acuity Scheduling lets you define some form questions that your customer will have to fill at the end of the scheduling process. With Acuity scheduling, it is possible to delegate your account management to people in your team for example. Acuity Scheduling lets you set a 2-way sync with your preferred calendars (Google Calendar, iCloud, Office 365, Outlook.com, Exchange). The appointments scheduled by your customers are automatically integrated in your preferred calendar. And, you are shown as busy in your Acuity calendars if you already have a meeting planned in your daily calendar. This prevents you from double booking. Acuity Scheduling lets you bill customers within the scheduling process. The appointment scheduling software is integrated with Stripe to have customers pay with their credit card directly from the scheduling page. With Vyte, you create your vyte page, your personal scheduling page in seconds. You connect your Google calendars (as many as you need) and sets your weekly availability. For example, you may want to accept meetings only during your office hours or only for some special days or times during the week. You share your personal link with anyone asking for a meeting. You can add your link in your email signature, for example, to let people book meetings with you at a convenient time. You just add in your link the duration that you want to accept to prevent people from booking you an hour when 15 minutes are enough. For example, with my vyte link vyte.in/manuel/15, people can only book 15-min meetings with me. Launched in 2006, Acuity Scheduling tends to be a little old, respect to new scheduling apps, including Vyte, released nearly 10 years later with the state-of-the-art elements of UX / UI codes. The more significant Acuity Scheduling’s weakness is that, at meeting confirmation, the customers receive an email with the final meeting but this meeting is not automatically added to their calendars. What sometimes happens is that your clients end up forgetting about the meeting or when they receive a reminder, they already booked a meeting at the same time. You need to reschedule the appointment which is a waste of time. Vyte works differently. At meeting confirmation, everyone gets a confirmation by email AND the meeting is also automatically added to everyone’s calendars. This prevents no show and double booking. 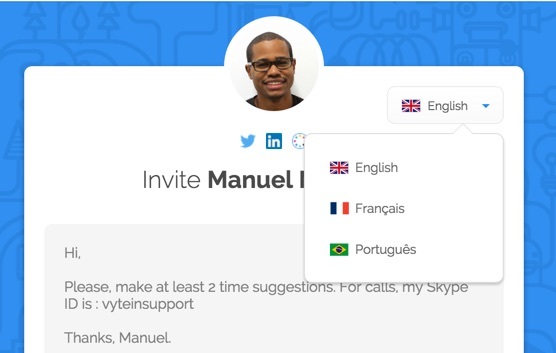 Vyte automatically detects your invitees’ language thanks to the language they set in their web browser. Your scheduling page will be displayed to them in their language, if that language is supported by Vyte (French, Portuguese, English). If not, your scheduling page will be displayed to them in English. In short, Vyte should be available in more languages, including Spanish. Contrary to Acuity Scheduling, you can also let people suggest multiple time options. Which can be very useful if you want to have the option to approve the time that suits you best. When someone suggest times on your vyte page (your personal scheduling page), these times are pre-booked in your calendar as Options to prevent double booking. At meeting confirmation, all the pre-booked options are cleaned from your calendar. You only keep the final date. 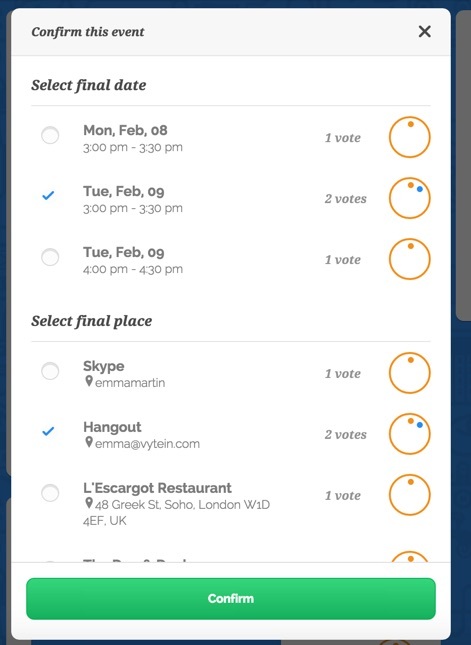 Contrary to Acuity Scheduling, Vyte offers the option to let your invitees suggest places that are convenient to them. You can suggest in the message box on your scheduling page a list of preferred places. 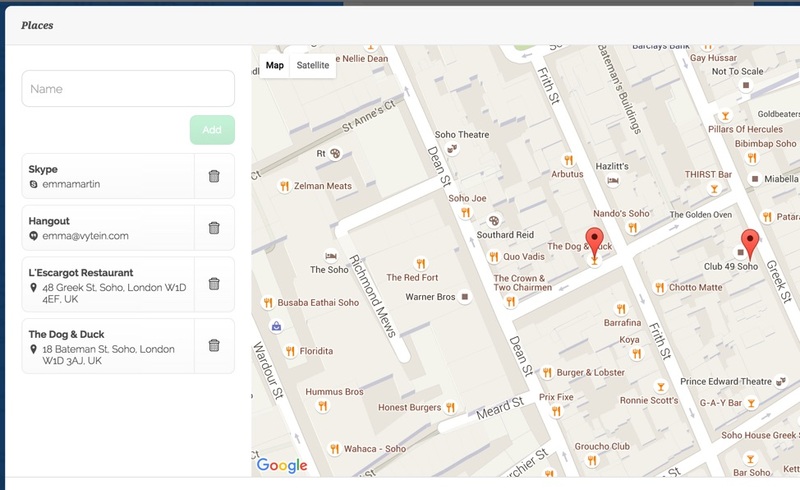 Your invitees can either suggest physical places or adresses, that are pinned on a Google map while adding them. They can also suggest the more famous communication tools such as Skype, HangOut, Whatsapp, GoToMeeting and add their IDs. Contrary to Accuity Scheduling that auto-confirms all your meeting requests on your scheduling page, Vyte is a good Acuity Scheduling alternative if you want to approve meetings before they are confirmed. 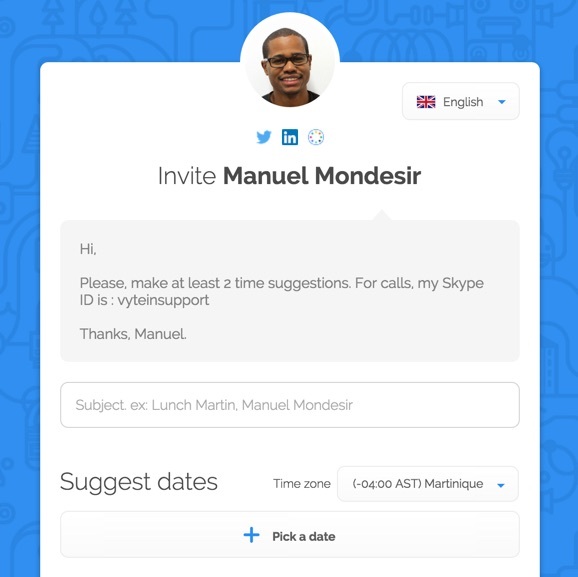 It is very useful, if you need to add extra invitees and let them suggest available times. Or if you want to suggest another time or another meeting duration if you think that the meeting duration is too short or (in more cases) too long. You can confirm the meeting in one click on cancel it. Your invitee receives an email in both cases. If you cancel it, your invitee receives an email with the information that the meeting has been cancelled. You can add a message in the message box if needed. If the meeting is confirmed, your invite (and you, also) receive an email with the final date. The meeting is also automatically added to everyone’s calendars to prevent double booking or no show. One day before the meeting, your invitee receives a reminder by mail. Great article, Acuity scheduling was actually named best appointment setting software by Fit Small Business due to their low cost and intergration options.